When I began researching Vitamin D requirements, being a nurse and interested in alternative health all of my life, I thought that I knew a bit about Vitamin D. Was I EVER wrong. I had no idea what I would discover. I’m familiar with the US RDA and know that the Vitamin D dosage in most supplements is about 400 International Units or IU’s. The US RDA, by the way, does not actually give a ‘recommended’ dosage for Vitamin D requirements. Instead, they give an ‘Adequate Intake’ recommendation. This Vitamin D dosage is set at 200 IU’s/day (all dosages are per day unless otherwise noted) for children and goes up to 600 IU’s for the elderly. In Europe, the Vitamin D dosage is between 400 to 800 IU’s and The Canadian Cancer Society is the highest at 1000 IU’s. "woefully inadequate, misleading and potentially harmful"
and that higher doses “would be far safer than the present median adult intake in the US"
Woefully inadequate and potentially harmful! Those are strong words. Researchers used to believe that Vitamin D mainly controlled calcium metabolism and therefore was only important in bone health. But new Vitamin D research shows that it is extremely important in regulating The Immune System, controlling the expression of thousands of genes and controlling the proliferation of cancer cells! These functions require MUCH higher Vitamin D Requirements to work properly. 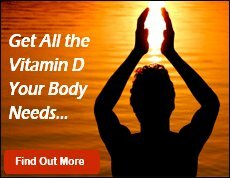 These researchers believe that widespread Vitamin D deficiency could be a major contributing factor to the current epidemic of cancer and diabetes!! So what are Optimal Vitamin D Requirements for Health? Well, every Vitamin D research study has a different theory on the exact Vitamin D dosage, but they are pretty close to each other – and they are no where NEAR the government recommended daily dose of Vitamin D mentioned above. On the Vitamin D Levels page, I discuss the Vitamin D Blood Test levels that current Vitamin D research is recommending. 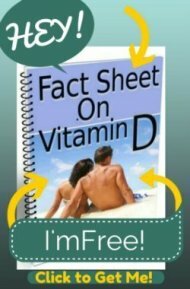 This is a well researched subject that doctors seem to be completely dismissing, and the daily dose of Vitamin D should be based on LEVELS, not some arbitrary amount that may not work for everyone. So what are some recommendations? Vitamin D Deficiency Treatment or you have problems with Absorbing Vitamin D then you are likely to need much higher doses- up to 50,000 IU's per Day in some cases!! A Vitamin D research paper called ‘What is the Dose-Response Relationship between Vitamin D and Cancer Risk’ makes some shocking statements. It says that a Vitamin D dosage of 2000 IU’s would be a minimal dose to provide “meaningful… breast cancer reduction”. They state unequivocally that a Vitamin D dosage of 3500 IU’s per day would prevent 50% of breast cancer incidences and would prevent over 350,000 cases of breast cancer worldwide!! -Donald Miller,MD. Cardiac surgeon and Professor of Surgery at the University of Washington,Seattle. And another doctor in clinical practice, Dr. Joseph Pizzorno, cites his experience with 1500 Canadians. His conclusion is, "...a loading dose of 10,000 IU's for 3 months and maintenance of 5000 IU's is not enough [Vitamin D] for most people in northern climes..."
This just goes to show you that your Vitamin D Requirements are MUCH higher than you've been told! 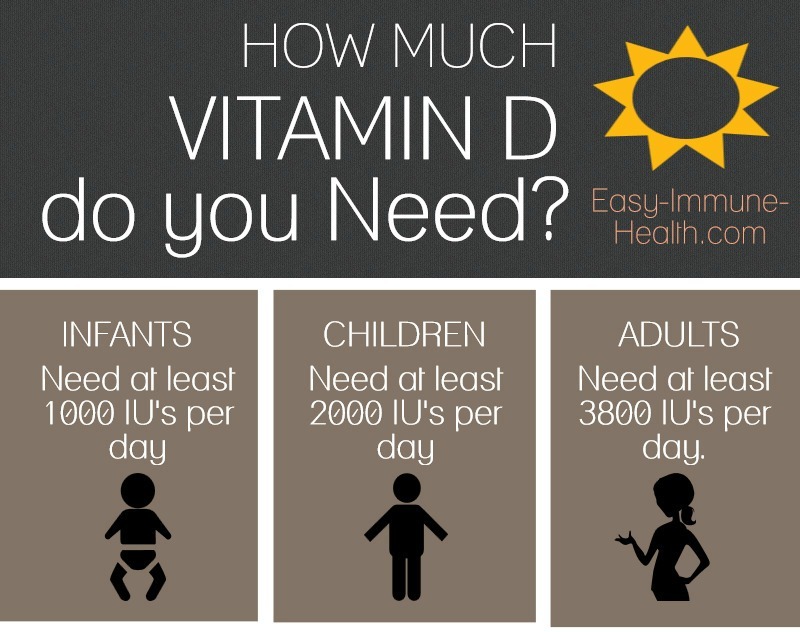 Infants and children have Vitamin D Requirements too. Although this need is NOT understood well in the medical community. While the 'traditional' view is that Vitamin D Deficiency in children ONLY causes rickets, and indeed, the prevention of rickets is the guideline by which the RDA is set. But more and more, research shows that children need a daily dose of Vitamin D for MUCH more that just the prevention of rickets. Although the rickets issue, too, may need may be revisited as Rickets Makes a Comeback. But just like adults, simply not having rickets does not necessarily mean that children have optimal Vitamin D levels or that they are having their Vitamin D requirements met. Children could have severe repercussions from having Vitamin D deficiency too. an extra 600 IU per day. 1,000 IU for every 25 pounds of body weight. in the absence of significant sun-exposure..."
In addition, a retrospective study of Finnish infants given Vitamin D and followed up years later showed an 80-90% reduction in the incidence of diabetes with a daily dose of Vitamin D of 2000 IU's a day throughout the first year of life! That's more than twice the recommended dose for pregnant women in the United States! And Sunshine Mist Vitamin D Spray is a GREAT way to dose children without them having to swallow pills. The studies on Vitamin D and Breastfeeding are just as damning. Women taking 400 IU's of vitamin d are not producing enough vitamin d to even prevent Rickets in their babies. Studies of 1000 IU's, 2000 IU's, 4000 IU's and 6400 IU's of Vitamin d per day show that ONLY the mothers that were taking 6400 IU's per day were able to make enough Vitamin D to meet their baby's RDA of Vitamin D! Read more about this on the Vitamin D and Breastfeeding page. So, what I want to know is why no one in the medical community is talking about the need for higher Vitamin D Requirements?? There is a huge amount of evidence out there showing that Vitamin D requirements should be MUCH higher than governmental recommendations and that more people getting more Vitamin D will absolutely save tens of thousands, if not hundreds of thousands of lives. But your doctor is not likely to be educated on current scientific recommendations of Vitamin D dosage. Remember, Vitamin D, as well as A, E and K, are FAT SOLUBLE vitamins. This means that any excess gets stored in your body. If you get too much, you CAN Overdose on Vitamin D and cause Vitamin D toxicity. 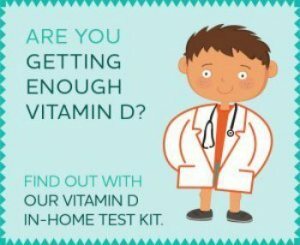 While this is rare with Vitamin D and the chance of taking too much are practically ZERO if you follow recommended dosages and get your Vitamin D Blood Levels Tested yearly, you must always remember that it IS possible. Keep reading for more information on the RIGHT supplements, and learn about Vitamin D overdose. See Already Answered Questions about Vitamin D Dosages! Click below to see already answered questions about Vitamin D Dosages! is a dose of 6000iu daily for a month safe? How much D3 to take? When do I Vitamin D test after loading?